Fossils and Colespits - Faringdon Community Website. Coxwell Pit was designated a site of special scientific interest (SSSI) in 2001 under the following criteria; Scientific, Historic, and Education value. The site is a disused sand and gravel quarry that forms part of a triplet of Sites of Special Scientific Interest in the area. Known as the Lower Greensand formation. These are the rocks which in Faringdon have yielded beautifully preserved fossils to be found in academic collections, museums, and geological survey and oil company reference collections all over the world. 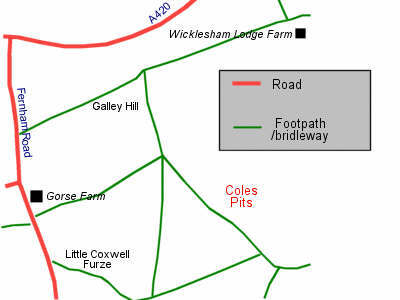 Cole's Pits is a neighbourhood specially interesting to geologists, having a curious variation of the Lower Greensand strata known as sponge gravels, which may have something to do with the pits which used to be scattered hereabouts. Were they the pit dwellings of early settlers? Local legend insists that the name derives from Old King Cole of the nursery rhyme, and the Cole's pit is the site of the one time merriment and fiddling. Cole's Pits, in the parish of Faringdon, were a local tourist attraction as early as 1687. Were they pit dwellings? For Saxons? There are 273 pits within 14 acres. They are between 7 & 22ft deep, and up to 40ft in diameter. Coll may mean "a hill" or a river name, "the River Coll"; or it may be a personal name, Coll or Col. Legend does say that Old King Cole lived here. The pits, however, are probably Neolithic flint mines like those at Grimes Graves (Norfolk). Cole's pits were destroyed in the 1950s.